Everest Base Camp is undoubtedly the most popular trek in Nepal, and possibly world too. Reaching the base camp of the highest peak and have a 360-degree panoramic view of the mountains is not just an adventurer’s dream but also of every other nature lover. However, it is not possible for everyone to trek to the basecamp. You will have to overcome so many physical and mental challenges to reach your destination. That’s why, it is only fit for those of certain age and have good stamina and health. Now, that’s where Everest Base Camp Heli Tour comes in the picture. Here, we have listed down 5 reasons why you should undertake Everest Base Camp Helicopter Tour. Anyone going to the Everest region is of course going for the mountains. You may have all heard of the Everest, but the region is home to other equally outstanding peaks including few eight thousanders as well! Other than the jaw-dropping views of the world’s tallest peak, you can have pretty awesome views of Mt. Lhotse (8,501m), Mt. Cho Oyu (8,153m), Mt. Pumori (7,165m), and Nuptse (7,864m). These are just some major mountains to name. You can view the entire major eastern Himalayan ranges from very close proximity along with the gigantic Khumbu Icefall, Ngozumpa glacier, and several mountain lakes. The truth is, you can feast your eyes on the mountains even before you reach your main destination. As soon as the flight takes off from Kathmandu, the regal central mountains like Langtang Lirung, Yangra, Jugal, and GauriShankar pop from behind the hills to greet you. If only we could, wouldn’t we all go to the mountains every weekend? However, the truth is that it is incredibly hard to even trek to its basecamp, let alone go on a climbing expedition. As beautiful and heavenly as the mountains are, they are extremely dangerous and unforgiving. Let’s not forget they are practically inaccessible. It takes years and years of training to be even eligible to ascend a summit peak of average elevation. Also, it is another real challenge to commit long weeks to trek to the basecamp. Everest Base Camp Heli Tour solves all these problems, thankfully. It is something that wasn’t possible a few decades ago. The rapid growth of aviation sector in Nepal has now made it possible to visit the basecamp of the highest peak by midday and return to your hotel in Kathmandu for dinner. Amazing right? 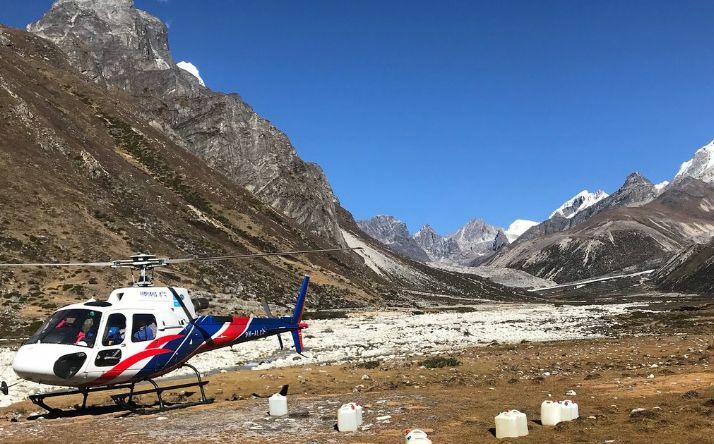 Everest Base Camp Heli Tour in itself is very special. To be in a very close proximity of the highest mountains in the world in Himalayans is surely one of the most incredible experiences you can enjoy with your loved ones. Now, wouldn’t it be even more special if you could share this journey of lifetime with your loved ones? And when your loved ones are not always young adults with good physical state, this heli tour comes handy. You can embark on this journey with almost anyone – a young child, an old parent, or a friend with special needs. You won’t have to worry very much about the potential thin air sickness, blistered feet, fractured leg, or just any other kind of hazard. So, one of the best advantages about the base camp heli tour is that you won’t have to worry about your company. After flying from Kathmandu, your chopper will directly land in Lukla. Lukla is a quaint, little village in the heart of the Khumbu region. It is also the starting point of almost all treks to the Everest region. Thus, no wonder this town is always abuzz and happening. Here, while your chopper is getting refueled, you can indulge yourself in some delicious Sherpa cuisine for breakfast. After that, you can explore this beautiful place on foot. Walking through its stone-paved alleys, glancing into one of its tin-covered colorful homes, and spending some time interacting with the lovely Sherpa people is surely one of the main highlights of this tour. Just like fun, the adventure begins as soon as get on the helicopter. Your aircraft will land in Lukla, which is also dubbed as the most dangerous airport in the world. The airport, perched on a hilltop between two massive boulders, will make sure that this ride will the most adrenaline-rushing flight of your life. Other than that, flying at such high altitude above the tall and rocky mountains, is no doubt a wonderful adventure.